PRONTO est une huile monocouche de grande qualité, à haute concentration de matières naturelles. Elle protège, colore et scelle le bois en une seule couche. Ses teintes naturelles et colorées donnent une apparence riche et un fini mat satiné. Types of use: Furnitures, kitchen counters, woodworks, post and beams, architectural elements, walls and ceilings. Cleaning: Ligna Solia soap for oiled surfaces / Solia+ Soap-wax for oiled surfaces / One coat of Ravivo maintenance refresher every 12-24 months. Composition : Plant product (54 %) : safflower oil, tung oil, linseed oil, vegetable wax, natural solvent and cobalt free siccative. Conservation : 2-3 years in an air tight container stored in a dry and not overheated room. Provenance : Ligna is a Canadian registered trademark, made for EVO Home Finishing, in Italy. The product is treated, packaged and distributed in Canada by EVO Home Finishing inc. Caution: After usage, the oiled rags and cloths must be immersed in water before disposal to avoid spontaneous ignition. You can also dry the cloths on a flat surface. Particular risk: Repeated skin contacts can provoke irritation. Safety advise: Keep out of the reach of children. PRONTO oil has an excellent coverage rate. A small quantity of oil is enough to cover a large surface. The quantity of oil to cover a given surface varies according to the hardness and the specie of the wood to be treated. The surface must be clean, and free of wax and varnish residue. Make sure the product is at room temperature before application. Room temperature must be over 15 °C. The product must be thoroughly mixed with a stick before application. The surface must be sanded in the trend of wood texture with a sandpaper #100-120 before application. As the oil penetrates deeper in a softer wood, we recommand the use of a sand paper #150 for soft woods. Do not use a damp cloth to remove dust. That would raise the wood structure in some spots, which would result in an uneven application. To remove the dust, use a vacuum and a tack cloth. As for a high density wood, as maple or exotic wood, it is important to raise the wood structure to get a better penetration. Directions for high density wood : Moisten the wood with a floor mop or a damp cloth. When the surface is completely dry (about two hours), sand the floor lightly with a sandpaper #220 to « break » the raised wood structure. Remove dust thoroughly and apply Pronto. As a monocoat, Pronto requires only one coat, but it is possible to apply a second coat, which gives a colour about 20% darker than a one coat application. On more sollicited surfaces as doors and windows, add a second coat, which will add to the lustre and protection. The natural color of PRONTO can be applied as a second coat to keep the color obtained after the first coat. 1- Apply a very thin coat with an applicator pad, a microfiber pad or a lambskin. 2– After a maximum of 15-20 minutes, rub the floor with a bleached cotton cloth, in the trend of the wood structure, to stimulate the penetration and eliminate any excess of oil. 1. Apply a very thin coat with an applicator pad, a microfiber pad or a lambskin. 2. Polish mechanically with a green pad to stimulate the penetration of the oil and to get a more even application. 3. Optional: To get a brighter gloss, one hour after application, polish with an electrical polisher equipped with a white pad. After 6-9 hours : moderate and careful use. After 10 days : completely dry, first use of Ligna cleaning products. 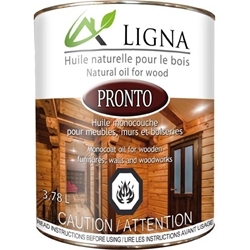 Ligna Natural Oils are a family of high-performance wood finishing products. Made up of a mix of vegetable oils traditionally used for wood finishing whose quality has been recognized for many decades, Ligna Oils are reinforced by the addition of resins and waxes, which give them excellent durability and an unprecedented high-end finish. Ligna has been working with renowned European laboratories, which have been offering experience and know-how in this field for over 50 years, to develop its products. Its ingredients and raw materials are imported from Europe; then they undergo their final transformation in Canada. Ligna is a Canadian brand that respects Canadian environmental norms and standards pertaining to health and safety. Even though they are made up of traditional ingredients, Ligna Products use the most recent wood protection technology. By offering a penetrating and non-film-forming finish, oil and resin crystallisation in the wood creates high-quality one coat protection. All our colouring agents are finely micronized to offer proper wood penetration, which enhances its grain and increases durability.